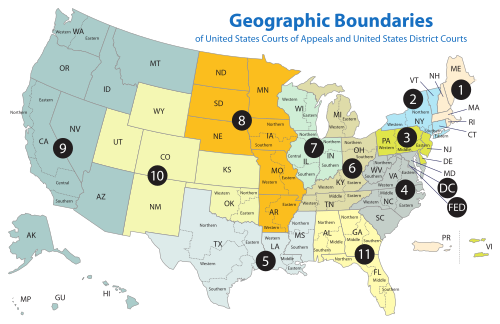 The United States District Court for the Middle District of Alabama (in case citations, M.D. Ala.) is a federal court in the Eleventh Circuit (except for patent claims and claims against the U.S. government under the Tucker Act, which are appealed to the Federal Circuit). The District was established on February 6, 1839 with the addition of the Middle district. The circuit court itself was established on June 22, 1874. The United States Attorney's Office for the Middle District of Alabama represents the United States in civil and criminal litigation in the court. The current United States Attorney is Louis V. Franklin Sr.. The United States District Court for the Middle District of Alabama is one of three federal judicial districts in Alabama. Court for the District is held at Dothan, Montgomery, and Opelika. 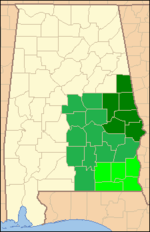 Eastern Division comprises the following counties: Chambers, Lee, Macon, Randolph, Russell, and Tallapoosa. Northern Division comprises the following counties: Autauga, Barbour, Bullock, Butler, Chilton, Coosa, Covington, Crenshaw, Elmore, Lowndes, Montgomery, and Pike. Southern Division comprises the following counties: Coffee, Dale, Geneva, Henry, and Houston. 10 Frank Minis Johnson AL 1918–1999 1955–1979 1966–1979 — Eisenhower appointment to 11th Cir. 15 Joel Fredrick Dubina AL 1947–present 1986–1990 — — Reagan appointment to 11th Cir. Browder v. Gayle (1956) – Court rules that bus segregation in Montgomery was unconstitutional under the Fourteenth Amendment. Decision upheld by U.S. Supreme Court six months later. Gomillion v. Lightfoot (1958) – Court dismissed action, which was later affirmed by the Fifth Circuit. In 1960, the U.S. Supreme Court reversed the decision, finding that electoral districts drawn in Tuskegee, with the purpose of disenfranchising black voters, violated the Fifteenth Amendment. Lee v. Macon County Board of Education (1963) – Court rules segregation in schooling was unconstitutional under the Fourteenth and Fifteenth Amendment. Decision upheld by U.S. Supreme Court. United States v. Alabama (1966) – Court rules poll tax violates the Fourteenth and Fifteenth Amendment. U.S. Supreme Court concurred three weeks later in an unrelated case, Harper v. Virginia Board of Elections. Glassroth v. Moore (2002) – Court rules that a display of the Ten Commandments, erected by Alabama Chief Justice Roy Moore in the Alabama Judicial Building violated the Establishment Clause of the First Amendment. ^ Recess appointment; formally nominated on January 23, 1860, confirmed by the United States Senate on January 30, 1860, and received commission on January 30, 1860. ^ Recess appointment; formally nominated on January 5, 1864, confirmed by the United States Senate on January 20, 1864, and received commission on January 20, 1864.